Hear about one of New Zealand’s top recruiters! BECA are sufficiently diverse to bring a wide range of perspectives, skills and disciplines to every client and every challenge. They are a team that understands the power of working together to bring resourceful, smart solutions from their collective experience and insights. Beca is a leading Asia Pacific multidisciplinary consultancy and has operated in over 70 countries. With around 3000 employees, their employee owned organization has the diversity of experience and skill to challenge major engagements. We have over 95 years’ experience in successful client relationships, technical excellence & delivering award-winning solutions. 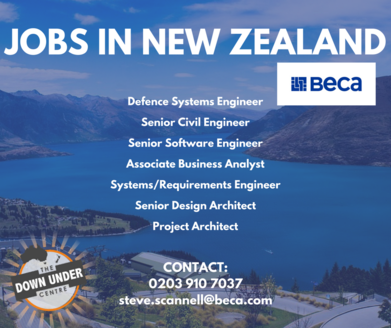 BECA have a number of engineering jobs available in New Zealand on our Jobs Page so you can apply right now! Read more about these jobs today and apply and BECA will get in touch with you directly! If you would like to hear more information about BECA or even speak to one of the team, be sure to register for our New Zealand webinars! BECA attend our monthly webinars to explain how you can apply for jobs with them and what they are looking for! We have a range of expert partners ready to assist you on your journey to New Zealand and BECA is one of them! Keep updated with upcoming events and webinars here.